Another of the consequences of our recent rain has been the emergence of thousands of cicada nymphs from their seven-year hibernation underground, to shed their skins, mate, lay eggs and then die. All this occurs in the space of a few weeks. For some people these are the longest weeks of summer, as waves of ear-piercing calls roll through the bush, drowning out all other sounds and making conversation difficult if not impossible. My friend Mary Ann who lives just out of Bellingen on a farm, is being driven slowly insane by 14 hours of non-stop noise every day. I discovered that Australia has over 200 species of cicada. Amongst them the colourfully named Black Prince, Floury Baker, Yellow Monday and Whisky Drinker (due to its red nose). Fortunately, it appears that only the Golden Drummer, Bottle, and Green Grocer have so far found my garden attractive. Unfortunately though, the Green Grocer is said to be one of the loudest insects in the world! 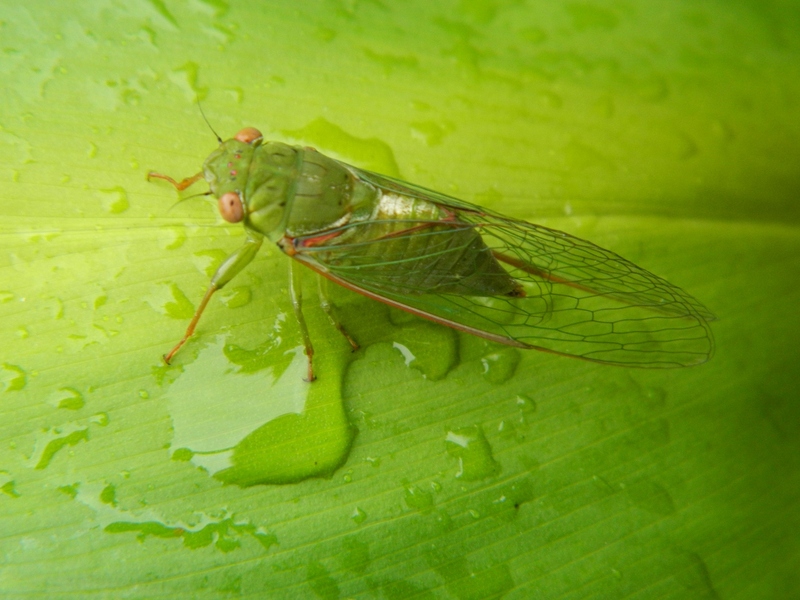 They are quite an attractive insect, but this amazing and slightly creepy film on American cicadas will make you look at them in a new light! I know what you mean -we had a weekend in the Blue Mountains just prior to the fires and the noise was incredible -no point in sitting out even though the weather was perfect as you couldn’t converse! They were falling out of the trees. Wow … that is extreme. It’s raining here today and the cicadas are mercifully silent!